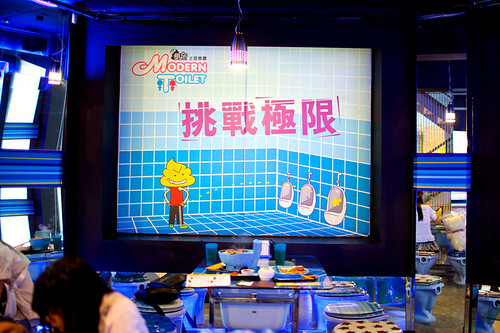 When I heard that Taipei had a toilet themed restaurant, it immediately became my mission to find this crazy place. and there are silly murals on the walls. and eat out of toilet bowls! I swear, that restaurant has become a must-see Taipei site! Super fun times!!! Love it. That's awesome! I wish I got to eat there when I was in Taipei years ago! 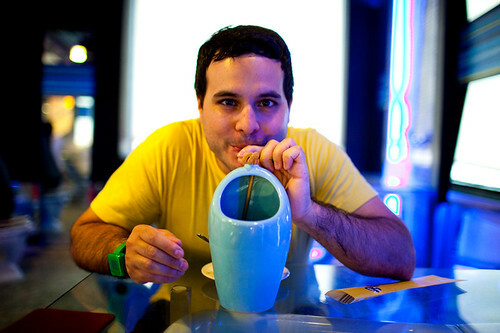 Did you have some bubble tea yet??? It's on EVERY corner! And you need to go to Shi Mun Ding (or however it's spelled)! Oh, so gross. I can only think of dirty toilets..... I hope everything was clean!!! hahaaa, this place looks absolutely amazing! hilarious. great post. id def want to see this place! but ooh man don't know if i could stomach all of it. hehe. holy cow. i'm sure i would be an irregular patron. ha, ha... irregular! hahahahaha - this really made me laugh :-) Thanks, I needed it! Wow, this is so crazy ;) I've never seen a place, esp. a restaurant like that! Curious...but funny. I've been there! Actually it was probably a different one--there are a few in Taipei. The seats were pretty uncomfortable, I thought... but fun theme! hmmm, gross....but cute...having a hard time computing this! it's definitely unlike anything i've ever seen! they have this same restaurant in Hong Kong too. i couldn't get past the way the ice cream looked. i just had fun taking photos but the dining experience wasn't fun at all. 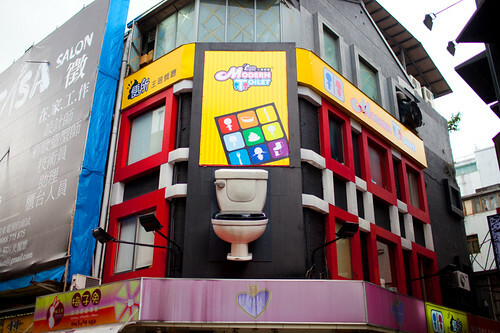 Toilet Themed Restaurant? That's awesome. Never heard of such a thing. Looks like you're having an awesome trip! you know, most of the people I know who have gone to Asia come home and complain how awful it is, how stinky, how bad the food and water, how crowded and expensive...and you have made it seem a delight. thank you for your insight. LOVE it!!!! WHY can't we have fun stuff like that here?!? this is thee greatest thing i have ever seen! awww you're so sweet Nina! Ah! I've been there before too. Except the one in hong kong! and the background music is flushing toilets? hahaha, this is super hilarious. 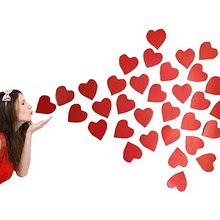 As always, I love your pictures! That is hilarious. I'm not sure I could do it, but looking at your super cute pics is enough for me! haha - and ewwwww at the same time!! What did their bathroom look like? that's hilarious! don't think I could eat it though. I love your expression in that last image--exactly how I think I'd feel! hahaha that place is awesome!!! Thats such a crazy idea!? I love people who think originally! That's funny. The post soviet union ice cream we used to have when I was a kid was a soft serve in sort of a sausage type container - and when we would squeeze it out it would look like well squeezed logs of doo. Yummy anyway. I totally want to visit this place. Don't know if I'll order the ice cream, though. WOW! What a great idea, That would be a success in any city. Woaw so funny! What about the real restrooms/toilets? hahaha the "sink" has an identity crisis, hilarious! I saw this on TV (either food network or travel channel maybe?) and am determined to make it here one day! How hilarious! This is exactly the sort of place my husband and I would seek out as well - ha ha! Fun! But, very strange. Love your blog and your outlook on life! I am an aspiring photographer so I love looking at your blog for inspiration. It's always so colorful! Have fun on the rest of your trip! That is so cool! I think I need to travel to Taipei. 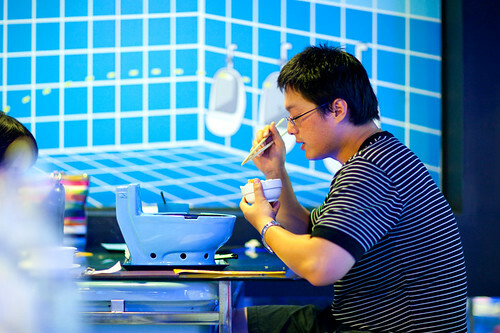 who wouldn't want to eat out of a toilet bowl? i think that dogs were on to something WAY before this rest. caught up. actually, i like it. their theme is really well done. and it was the best damn ice cream i ever ate. I love your blog, it never fails to cheer me up on a bad day. Thank you! Awesome! This place looks like an absolute blast! I just saw something on the Travel channel about an insane asylum/jailhouse theme restaurant in Tokyo where you eat behind bars. Too cool! Why are your photos so amazing?! How did you manage to take such wonderful pictures inside the restaurant? I mean don't usually restaurants have bad lighting? What do you do when there isn't any good lighting indoors? Haha, sorry that was my first thought and i just wanted to know! :) Hope you'll have the time to reply me. wow, that is incredible -- but no way I could eat there! @Shu-iiiii- awww thank you! I actually photograph a lot of restaurants in NYC for one of my jobs so I'm really used to it. You could bump up the ISO and shoot at a really wide aperture like 1.4, or bounce a flash off of a white ceiling or wall and use a long exposure. My Son does daddy/daughter dates. 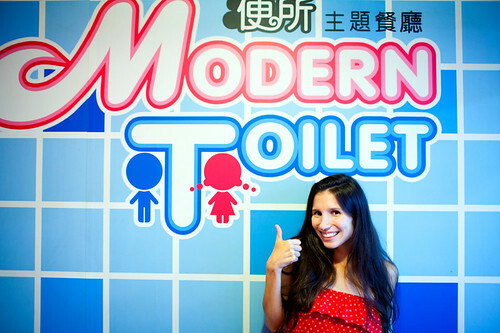 They live in Taipei... he took her to Modern Toilet when she was fully potty trained. She loved it since her life had been so focused on potties. 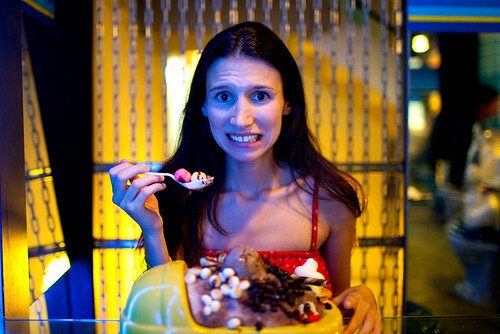 She also had the chocolate ice cream but it was served to look like poop. Poop shapes and humor is very popular with children in Asia. 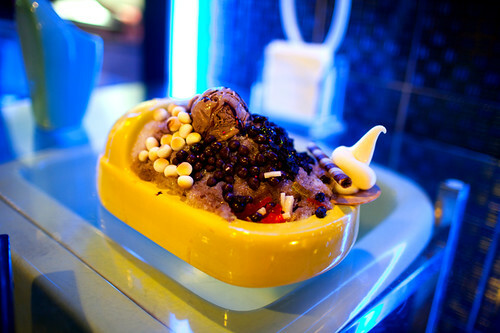 I enjoy Ice Monster in Taipei, but recently they closed. That is SOOOO excellent! Great job photographing it all, too!!! When I see your pics from your trip, it's like the city was made just for you and your camera. Soooo glad you found it. It's too bad I found out to late about the Taipei events, but I hope you had fun here. They have a restaurant like this in Malaysia! Wow, I so wanna go here! this is why Asia is awesome! 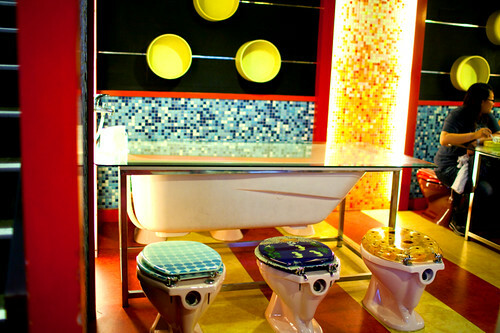 we think that i also visit and sit in this one toilet. so i waiting to come their and take lunch with toilet seat.